If you were watching last week’s city council meetings you would have noticed that in the morning two representatives of the city employees were present and in the evening they were joined by every city worker. 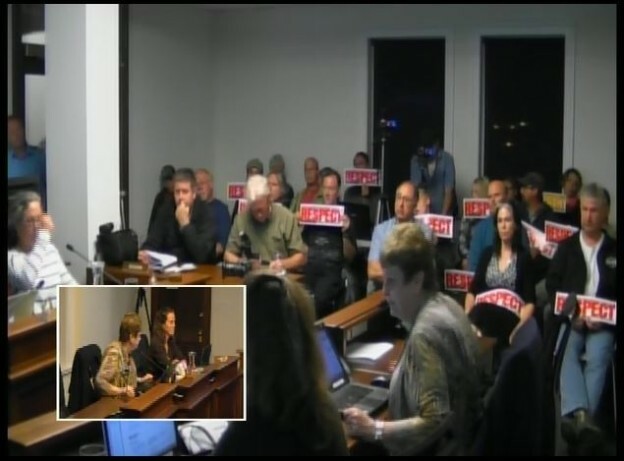 Council declined to hear their words in the morning and since they were not on the evening agenda it was a bit of a silent message – nearly everyone in the gallery was holding a sign that read ‘RESPECT’. All this has to do with the city’s plans for Asset Management and the required fiscal changes … one part of which sees 3 Full Time Equivalent worker positions being cut out of the system altogether. Below you can see and listen to representatives of both sides. Mr. Allin for the City and Mr. Lawrence for the Workers. This entry was posted in City, government and tagged Asset managemnt, city, CUPE, government on September 21, 2015 by gftvboss.